This is why we encourage all adults to make and discuss the Kidpower Protection Promise with each of the young people in their lives. However, we then need to be prepared to keep that promise! 1. Put Safety First. Show kids that you put emotional and physical safety ahead of avoiding uncomfortable feelings – ahead of winning – ahead of fortune and fame – ahead of instant gratification. 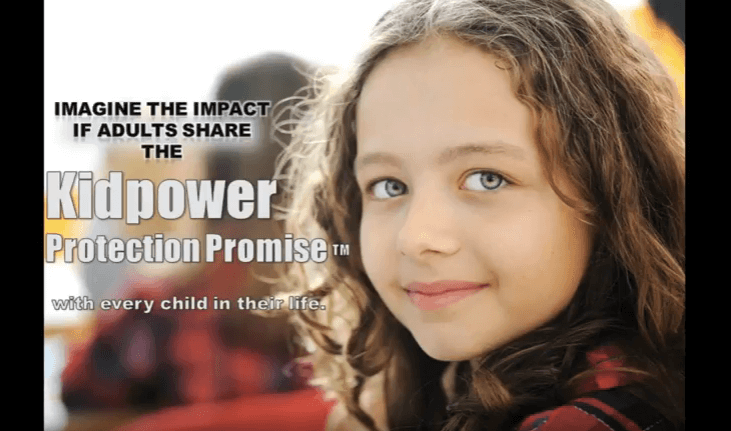 Kidpower’s core principle is: “The safety and well being of a child are more important than anyone’s embarrassment, inconvenience, or offense.” This value is easy to agree with in principle, but hard to act on in real life. We need to make a conscious commitment to advocate for our kids, even if someone will be upset with us, even if it costs time or money, even if they get mad at us, and even if it’s embarrassing. Remember that our kids learn more from what we DO than from what we SAY. Child protection requires putting safety first. 2. Keep your radar on. Stay in charge of what is happening with your kids. 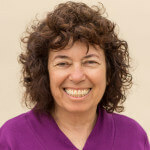 Insist on all caregivers and professionals providing powerful, respectful adult leadership. Remember that people who are a danger to kids often look and act very nice. Don’t let your kids be in places or with people where you are not welcome. Drop in unexpectedly. Pay attention to your intuition. If you feel uncomfortable or your gut makes you worry that something might be wrong, insist on answers. Notice and ask yourself questions if someone seems to be singling your child out for special gifts, favors, or time alone where others are not around. 4. Make SURE Kids know you CARE. Don’t assume that a child knows or remembers. Keep telling them and keep showing them how important they are to you. Don’t expect your child or yourself to be perfect. Respect each child’s right to be different. When you need to set boundaries or provide guidance, do it in a firm and respectful way, rather than shaming the child. If you make a mistake and say or do something hurtful, apologize. Pay attention anytime a child expresses a concern to you about being with someone or going someplace. By listening compassionately, you can usually help the child figure out good solutions – or, once in a while, you might learn about a potential problem where you need to advocate on your child’s behalf. 6. 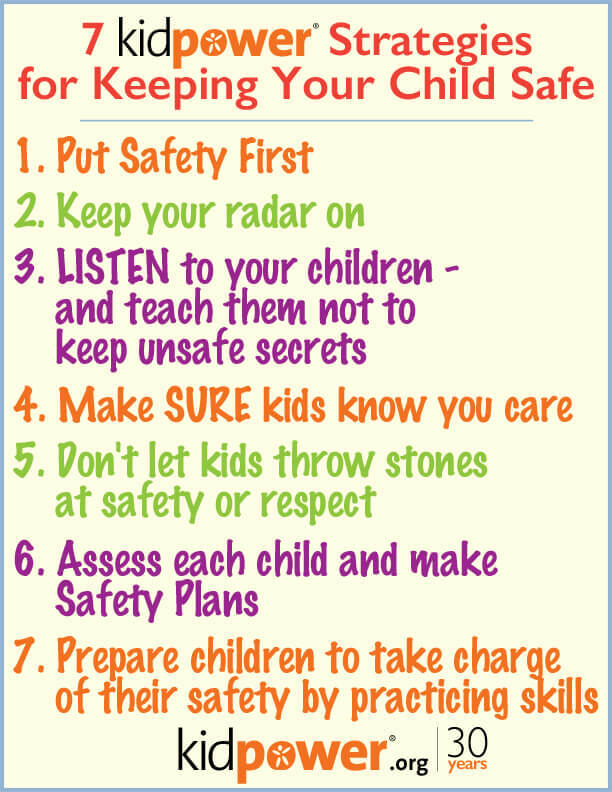 Assess each child and make Safety Plans. Remember that safety is an ongoing conversation, not a one-time lesson – and that kids need time and practice to develop the emotional, mental, and physical capacity to make safe and wise choices in real-life situations. 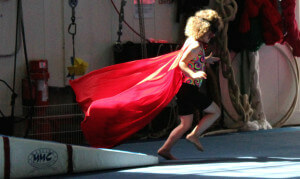 Assess realistically the capabilities and vulnerabilities of your child. Make a list of everywhere your child goes, what kinds of problems they might encounter, and how they would avoid the problem and get help if necessary. Before you let your child go anywhere without adult protection, make sure that your child is prepared with sufficient knowledge, skills, and life experience. 7. Prepare children to take charge of their safety by practicing skills. One quick action can stop most abuse bullying, and other forms of emotional or physical violence – using your awareness, checking and thinking first, moving away from trouble, acting respectfully confident, staying in charge of what you say and do no matter how you feel inside, setting boundaries, ordering someone to stop, leaving as soon as you can, resisting emotional coercion, and being persistent in telling until you get help. From the age of 6 and up, we also recommend teaching children physical self-defense skills for emergency situations where they are in danger and cannot leave or get help. Kids are more likely to be able to take actions like these when they need to if they understand their safety rules and have the chance to rehearse using these skills in a fun, age-appropriate way. Not sure HOW to teach skills? 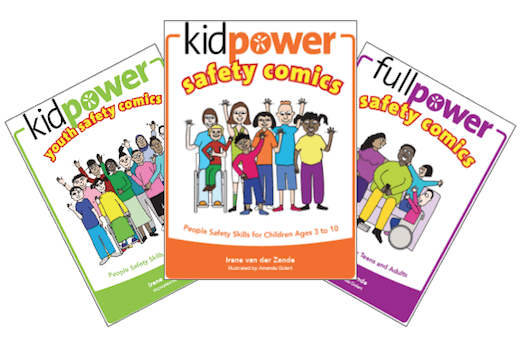 Our Safety Comics series for younger children, older children and teens/adults provide entertaining and useful tools for introducing and practicing “People Safety” rules and skills. 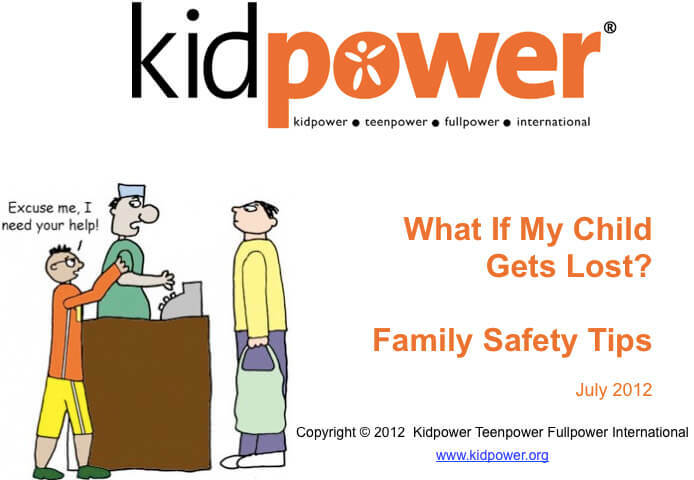 Our 7 Kidpower Strategies for Keeping Your Child Safe Video Series has interviews about each of the above strategies. 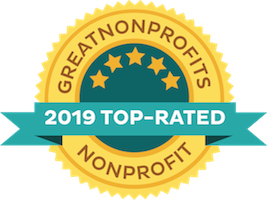 Since 1989, Kidpower Teenpower Fullpower International has protected over 4 million children, teens, and adults, including those with special needs, from bullying, violence, and abuse through empowering people with knowledge and skills. 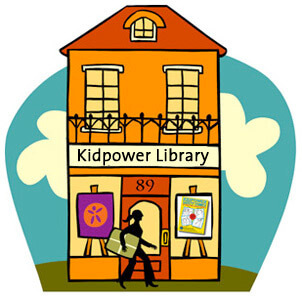 For information about in-person training, our extensive free online Library, consulting, and books email safety@kidpower.org.